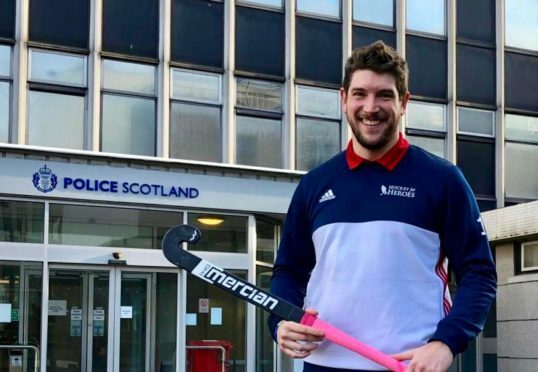 A north-east police officer is hoping to take the sport of hockey to new heights this summer – setting a new world record in the process. Constable Aaron White has started a gruelling training regime as part of this years’ Hockey for Heroes challenge, in between shifts as a roads officer based in Inverurie. PC White is part of a 15-strong team that will travel to Nepal in July in the hope of breaking the record for the highest altitude game of hockey ever played. The 70-minute match will take place 5,200 metres above sea-level within the dramatic Annapurna mountain range. It will be live-streamed in its entirety in conjunction with Guinness World Record specifications. Last night, PC White said he was looking forward to the “fantastic” opportunity and said he has high hopes of introducing a love of the sport to some of the remotest Nepalese communities. He said: “We want to bring hockey to some of the most rural parts of the country. “For us the biggest challenge will be the trekking. “Some of us have been using altitude chambers in the UK to acclimatise, as we will only have a couple of days to get ready once we arrive there. The Hockey for Heroes charity has supported the Help for Heroes cause since 2012 and encompasses a mixture of exceptional physical exertion combined with playing hockey. Brought up as a forces child himself, PC White said the charity was “very close his heart”. “It is a fantastic charity,” he said. Hockey for Heroes spokesman Joel Forrester said he hoped the world record effort would ensure the whole world heard the charity’s message. “Irrelevant of the nation in which you reside, war affects all and those affected should never be forgotten,” he said. “On this expedition to Nepal, it is our aim to teach and inspire the future players of our sport, about their military history, recent and far in the past. He added: “The humanitarian aspect to this trip is also something we are really looking forward to. “Delivering equipment and hockey coaching sessions to people in the most remote part of the world is something that we are passionate about. To donate to PC White’s fundraising challenge, visit www.justgiving.com/fundraising/hockey-for-heroes.